NHS is a prominent club on campus, though many scholars may not understand what the organization actually does. The National Honor Society is a group of scholars that gather together to help out the community by hosting different activities, which help students learn responsibility, leadership skills, and the importance of giving back. 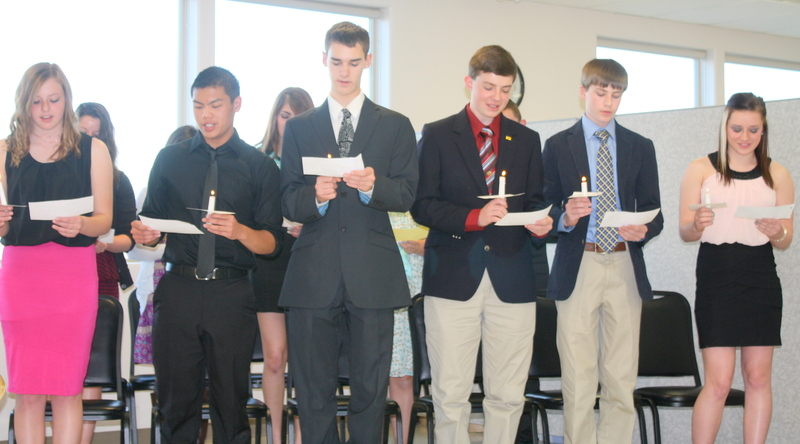 New members were inducted into the National Honor’s Society in early April. “National Honor Society is definitely a great opportunity; it gives you opportunities to learn leadership in different areas,” states Vice President of NHS, senior Sierra Strebe. The National Honor Society hosted a variety of events on campus this year, including weeding the grounds around the ASK campus. Or the annual dodge ball tournament, which helped scholars learn to work as a team, get active, and strengthened the relationship between scholars and project managers. “The dodge ball game was very successful, and I think that everyone that attended had a great time,” Strebe states. NHS recently held an inductee ceremony where 11 new scholars were inducted into the society. It is the first time in ASK history that there have been more females than males, said senior Briana Hendrix, President of NHS. This year also boasted the largest number of inductees. “It’s nice to have more students involved, because now the room is now full,” states Strebe. At the moment, Paul Stephenson, director of the club, said NHS is planning a day where ASK scholars help senior citizens strengthen their technology skill at the Meadowlark Nursing Home. NHS Induction ceremonies occur once a year. Scholars must apply for membership, then a committee of staff members decide who will be inducted based on current GPA, attitude, and previous community experience. The next inductee ceremony will be held in the Spring of 2015.